The Great Danish[a] Army, known by the Anglo-Saxons as the Great Heathen Army (OE: mycel hæþen here), was a coalition of Norse warriors, originating in Denmark but also from Norway and Sweden, who came together under a unified command to invade the four Anglo-Saxon kingdoms that constituted England in AD 865. Since the late 8th century, the Vikings had primarily engaged in "hit-and-run" raids on centres of wealth such as monasteries. The Great Heathen Army was distinct from these raids in that it was much larger and formed to occupy and conquer large territories. 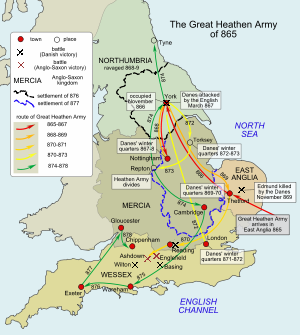 The name Great Heathen Army is derived from the Anglo-Saxon Chronicle of 865. Legend has it that the force was led by four of the five sons of Ragnar Lodbrok, including Hvitserk, Ivar the Boneless, Bjorn Ironside and possibly Ubba. [b] The campaign of invasion and conquest against the Anglo-Saxon kingdoms lasted 14 years. Surviving sources give no firm indication of its numbers, but it was amongst the largest forces of its kind. The invaders initially landed in East Anglia, where the king provided them with horses for their campaign in return for peace. They spent the winter of 865–66 at Thetford, before marching north to capture York in November 866. York had been founded as the Roman legionary fortress of Eboracum and revived as the Anglo-Saxon trading port of Eoforwic. During 867, the army marched deep into Mercia and wintered in Nottingham. The Mercians agreed to terms with the Viking army, which moved back to York for the winter of 868–69. In 869, the Great Army returned to East Anglia, conquering it and killing its king. The army moved to winter quarters in Thetford. By this time, only the kingdom of Wessex had not been conquered. In May of 878 Alfred the Great defeated the Vikings at the Battle of Edington, and a treaty was agreed whereby the Vikings were able to remain in control of much of northern and eastern England. The Anglo-Saxon Chronicle does not mention the reason for this invasion, perhaps due to the fact that Viking raids were fairly common during that period of time. The Tale of Ragnar’s Sons, on the other hand, mentions that the invasion of England by the Great Heathen Army was aimed at avenging the death of Ragnar Lodbrok, a legendary Viking ruler of Sweden and Denmark. [c] In the Viking saga, Ragnar is said to have conducted a raid on Northumbria during the reign of King Ælla. The Vikings were defeated and Ragnar was captured by the Northumbrians. Ælla then had Ragnar executed by throwing him into a pit of venomous snakes. When the sons of Ragnar received news of their father’s death, they decided to avenge him. Viking[d] raids began in England in the late 8th century, primarily on monasteries. The Anglo-Saxon Chronicle for AD 787 [e] reports the first confrontation with the Vikings in England. This incident is regarded, by some, as the first raid on England. Æthelweard's version of the Chronicle, known as the Chronicon Æthelweardi, has a slightly different version of events, saying that the reeve, a certain Beaduheard, had spoken to the visitors in an "authorative tone" and this is why they killed him. Despite this setback, Æthelwulf did have some success against the Vikings. The Anglo-Saxon Chronicle has repeated references during his reign of victories won by ealdormen with the men of their shires. However, the raiding of England continued on and off until the 860s, when instead of raiding, the Vikings changed their tactics and sent a great army to invade England. This army was described by the Anglo-Saxon Chronicle as a "Great Heathen Army" (OE: mycel hæþen here or mycel heathen here). Historians provide varying estimates for the size of the Great Heathen Army. According to the 'minimalist' scholars, such as Pete Sawyer, the army may have been smaller than traditionally thought. Sawyer notes that the Anglo-Saxon Chronicle of 865 referred to the Viking force as a Heathen Army, or in Old English "hæþen here". The law code of King Ine of Wessex, issued in about 694, provides a definition of here (pronounced /ˈheːre/) as "an invading army or raiding party containing more than thirty five men", thus differentiating between the term for the invading Viking army and the Anglo-Saxon army that was referred to as the fyrd. The scribes who wrote the Anglo-Saxon Chronicle used the term here to describe the Viking forces. The historian Richard Abels suggested that this was to differentiate between the Viking war bands and those of military forces organised by the state or the crown. However, by the late 10th and early 11th century, here was used more generally as the term for army, whether it was Viking or not. Sawyer produced a table of Viking ship numbers, as documented in the Anglo-Saxon Chronicle, and assumes that each Viking ship could carry no more than 32 men, leading to his conclusion that the army would have consisted of no more than 1,000 men. Other scholars give higher estimates. For example, Laurent Mazet-Harhoff observes that many thousands of men were involved in the invasions of the Seine area. However, Mazet-Harhoff does say that the military bases that would accommodate these large armies have yet to be rediscovered. Guy Halsall reported that, in the 1990s, several historians suggested that the Great Heathen Army would have numbered in the low thousands; however, Halsall advises that there "clearly is still much room for debate". The army probably developed from the campaigns in France. In Francia, there was a conflict between the Emperor and his sons, and one of the sons had welcomed the support from a Viking fleet. By the time that the war had ended, the Vikings had discovered that monasteries and towns situated on navigable rivers were vulnerable to attack. In 845, a raid on Paris was prevented by the large payment of silver to the Vikings. The opportunity for rich pickings drew other Vikings to the area, and by the end of the decade all the main rivers of West Francia were being patrolled by Viking fleets. In 862, the West Frankish king responded to the Vikings, fortifying his towns and defending his rivers, thus making it difficult for the Vikings to raid inland. The lower reaches of the rivers and the coastal regions were left largely undefended. Religious communities in these areas, however, chose to move inland away from the reaches of the Viking fleets. With the changes in Francia making raiding more difficult, the Vikings turned their attention to England. The term vikingr simply meant pirate, and the Viking heres may well have included fighters of other nationalities than Scandinavians. The Viking leaders would often join together for mutual benefit and then dissolve once profit had been achieved. Several of the Viking leaders who had been active in Francia and Frisia joined forces to conquer the four kingdoms constituting Anglo-Saxon England. The composite force probably contained elements from Denmark, Norway, Sweden and Ireland as well as those who had been fighting on the continent. The Anglo-Saxon historian Æthelweard was very specific in his chronicle and said that "the fleets of the viking tyrant Hingwar landed in England from the north". The Vikings had been defeated by the West Saxon King Æthelwulf in 851, so rather than land in Wessex they decided to go further north to East Anglia. Legend has it that the united army was led by the three sons[b] of Ragnar Lodbrok: Halfdan Ragnarsson, Ivar the Boneless (Hingwar), and Ubba. Norse sagas consider the invasion by the three brothers[c] as a response to the death of their father at the hands of Ælla of Northumbria in 865, but the historicity of this claim is uncertain. In late 865, the Great Heathen Army encamped in the Isle of Thanet and was promised by the people of Kent danegeld in exchange for peace. Regardless, the Vikings did not abide by this agreement and proceeded to rampage across eastern Kent. The Vikings used East Anglia as a starting point for an invasion. The East Anglians made peace with the invaders by providing them with horses. The Vikings stayed in East Anglia for the winter before setting out for Northumbria towards the end of 866, establishing themselves at York. In 867, the Northumbrians paid danegeld and the Viking Army established a puppet leader in Northumbria before setting off for the Kingdom of Mercia, where in 867 they captured Nottingham. The king of Mercia requested help from the king of Wessex to help fight the Vikings. A combined army from Wessex and Mercia besieged the city of Nottingham with no clear result, so the Mercians settled on paying the Vikings off. The Vikings returned to Northumbria in autumn 868 and overwintered in York, staying there for most of 869. They returned to East Anglia and spent the winter of 869–70 at Thetford. There was no peace agreement between the East Anglians and the Vikings this time. When the local king Edmund fought against the invaders, he was captured and killed. In 871, the Great Summer Army arrived from Scandinavia, led by Bagsecg. The reinforced Viking army turned its attention to Wessex but the West Saxons, led by King Æthelred's brother Alfred, defeated them on 8 January 871 at the Battle of Ashdown, slaying Bagsecg in the process. Three months later, Æthelred died and was succeeded by Alfred (later known as Alfred the Great), who bought the Vikings off to gain time. During 871–72, the Great Heathen Army wintered in London before returning to Northumbria. It seems that there had been a rebellion against the puppet ruler in Northumbria, so they returned to restore power. They then established their winter quarters for 872–73 at Torksey in the Kingdom of Lindsey (now part of Lincolnshire). The Mercians again paid them off in return for peace, and at the end of 873 the Vikings took up winter quarters at Repton in Derbyshire. In 874, following their winter stay in Repton, the Great Heathen Army drove the Mercian king into exile and finally conquered Mercia; the exiled Mercian king was replaced by Ceowulf. According to Alfred the Great's biographer Asser, the Vikings then split into two bands. Halfdan led one band north to Northumbria, where he overwintered by the river Tyne (874–75). In 875 he ravaged further north to Scotland, where he fought the Picts and the Britons of Strathclyde. Returning south of the border in 876, he shared out Northumbrian land amongst his men, who "ploughed the land and supported themselves"; this land was part of what became known as the Danelaw. According to Asser, the second band was led by Guthrum, Oscetel, and Anwend. This group also left Repton in 874 and established a base at Cambridge for the winter of 874–75. In late 875 they moved onto Wareham, where they raided the surrounding area and occupied a fortified position. Asser reports that Alfred made a treaty with the Vikings to get them to leave Wessex. The Vikings left Wareham, but it was not long before they were raiding other parts of Wessex, and initially they were successful. Alfred fought back, however, and eventually won victory over them at the Battle of Edington in 878. This was followed closely by what was described by Asser as the Treaty of Wedmore, under which England was divided between the Anglo-Saxons of Wessex and the Vikings. Guthrum also agreed to be baptised. In late 878, Guthrum's band withdrew to Cirencester, in the kingdom of Mercia. Then, probably in late 879, it moved to East Anglia, where Guthrum, who was also known by his baptismal name of Aethelstan, reigned as king until his death in 890. The part of the army that did not go with Guthrum mostly went on to more settled lives in Northumbria and York. Some may have settled in Mercia. Evidence for this is the presence of two Viking cemeteries in Derbyshire that are believed to be connected to the Great Army, at Repton and at Heath Wood. In 878, a third Viking army gathered on Fulham by the Thames. It seems they were partly discouraged by the defeat of Guthrum but also Alfred's success against the Vikings coincided with a period of renewed weakness in Francia. The Frankish emperor, Charles the Bald, died in 877 and his son shortly after, precipitating a period of political instability of which the Vikings were quick to take advantage. The assembled Viking army on the Thames departed in 879 to begin new campaigns on the continent. In 892, the army that had encamped on Fulham, now compromising 250 ships had returned and re-established itself in Appledore, Kent. Another army of 80 ships soon afterwards also encamped in Milton Regis, posing a threat to the West Saxons. The army subsequently launched a series of attacks on Wessex. Due in part to the king's efforts to resist the invaders and defend Wessex, the Danish army made less of an impact against the kingdom than hoped and saw little progress, eventually disbanding in 896. Throughout the 880s, the Viking presence in his kingdom encouraged Alfred to protect Wessex. The king realized the importance of naval combat against the Vikings and saw to it the creation of a navy; Alfred ordered the construction of specialized ships that were supposedly twice as long as Danish ships, some possessing 60 oars, others possessing even more. Alfred also reorganized the army and set up a powerful system of fortified towns known as burhs. He mainly used old Roman cities for his burhs, as he was able to rebuild and reinforce their existing fortifications. Every freeman in the land could be called out to protect the realm in times of trouble but the speed of Viking hit-and-run raids had been too quick for the local militias to act; part of Alfred's reforms were to create a standing army that could react rapidly to attacks. The Anglo-Saxon rural population lived within a 24 km (15-mile) radius of each burh, so they were able to seek refuge when necessary. To maintain the burhs, as well as the standing army, Alfred set up a system of taxation and conscription that is recorded in a document now known as the Burghal Hidage. The burhs were connected with a network of military roads, known as herepaths, enabling Alfred's troops to move swiftly to engage the enemy. Some historians believe that each burh would have had a mounted force ready for action against the Vikings. Based on figures from the Burghal Hidage, it is probable that a fifth of the adult male population of Wessex (27,000 men) would have been mobilized. A common Viking tactic was to seize a centre, usually some sort of fortification, that they could reinforce and then use as a base to plunder the surrounding district. From 884 Alfred's reforms prevented them from doing this in Wessex. By 896, the Viking army was all but defeated and no longer saw any reason to continue their attacks and dispersed to East Anglia and Northumbria. Those that were penniless found themselves ships and went south across the sea to the Seine. This influx of new settlers helped consolidate the ever-growing establishment of danelaw. Anglo-Saxon England had been torn apart by the invading Great Heathen Army and the Vikings had control of northern and eastern England, while Alfred and his successors had defended their kingdom and remained in control of Wessex. The stone church of St Wystan at Repton was, in the 9th century, the site of an Anglo-Saxon monastery and church. Excavations at the site between 1974–1988 found a D-shaped earthwork on the river bank, incorporated into the church. This area was quite modest in size, enclosing an area of perhaps 0.6ha. Burials of Viking type were made at the east end of the church, and an existing building was cut down and converted into the chamber of a burial mound that revealed the disarticulated remains of at least 249 people, with their long bones pointing towards the centre of the burial. A large stone coffin was found in the middle of the mass grave; however, the remains of this individual did not survive. A study of the skeletal remains revealed that at least 80% of the individuals were male, and were between the ages of 15 and 45. Further investigation of the male skeletal remains revealed that they were dissimilar to the local population of Repton, and most likely of Scandinavian descent, many showed signs of violent injury. In contrast, analysis of the female remains revealed that they were similar to the local population, suggesting an Anglo-Saxon lineage. It is possible that the people in the grave may have suffered some sort of epidemic when the army overwintered in Repton during 873–74, leading to the mass burial. A variety of Viking artifacts, such as a silver Thor's hammer, were also found among the bones. Although initial radiocarbon dating suggested that the bodies had accumulated there over several centuries, in February 2018, a team out of the University of Bristol announced that the remains could indeed all be dated to the late 9th century, consistent with the time the army wintered in Derbyshire. They attributed the initial discrepancies to the high consumption of seafood by the Vikings. Because the carbon in the Earth's oceans is older than much of the carbon found by organisms on land, radiocarbon dating must be adjusted. This is called the marine reservoir effect. The nearby cemetery at Heath Wood barrow cemetery contains about sixty cremations (rather than burials). Finds of cremation sites in the British Isles are very rare, and this one probably was the war cemetery of the Great Heathen Army. ^ a b The Anglo-Saxon Chronicle called the Vikings Danes, Pagans or Northmen. However, it should not be assumed that they were purely Danish as they could also be derived from Sweden, Norway and Frisia. ^ a b The Danish historian Saxo Grammaticus gives Ragnar no less than 10 sons; however, the Anglo-Saxon Chronicle says that only three took part in the invasion. It is likely that the sagas of Ragnar and his sons, although based in history, were a literary invention. The historical foundation is more likely found in the French and English chronicles. ^ a b There is nothing in the annals to suggest that the brothers invaded England to avenge their father's killing. Also there is no reference to them being the sons of Ragnar. ^ The word "Viking" is a historical revival; it was not used in Middle English, but it was revived from Old Norse vikingr "freebooter, sea-rover, pirate, Viking", which usually is explained as meaning properly "one who came from the fjords" from vik "creek, inlet, small bay" (cf. Old English wic, Middle High German wich "bay", and the second element in Reykjavik). But Old English wicing and Old Frisian wizing are almost 300 years older, and probably derive from wic "village, camp" (temporary camps were a feature of the Viking raids), related to Latin vicus "village, habitation". ^ The Annals of Bertin mention the attack as happening in 844; compared to 840 in the Anglo Saxon Chronicle. ^ a b c Munch. Norse Mythology - Legends of Gods and Heroes. pp. 357-359. ^ a b c Richards, Julian D.; et al. (2004). "Excavations at the Viking barrow cemetery at Heath Wood, Ingleby, Derbyshire" (PDF). The Antiquaries Journal. 84 (84): 23–116. doi:10.1017/S0003581500045819. Archived (PDF) from the original on 2 October 2011. ^ Nelson. The Annals of St-Bertin. p. 59. ^ a b Corpus Christi College, Cambridge, MS 173, ff. 1v-32r. Archived 12 February 2009 at the Wayback Machine Retrieved 17 April 2013. * The entry for 865 refers to the Heathen Army as hæþen here. * The entry for 866 describes the Great Army as micel here. ^ The Anglo-Saxon Chronicle. Manuscript B: Cotton Tiberius A.vi Archived 17 October 2013 at the Wayback Machine. Retrieved 20 August 2013. The entry for 867 refers to the Great Heathen Army as mycel hæþen here. ^ Attenborough. The laws of the earliest English kings. pp. 40–41 Archived 10 March 2016 at the Wayback Machine – "We use the term thieves if the number of men does not exceed seven. A band of marauders for a number between seven and thirty five. Anything beyond that is a raid'." ^ Christopher Wright. Kent through the years. p. 54. ISBN 978-0-7134-2881-0. ^ Hooper, Nicholas Hooper; Bennett, Matthew (1996). The Cambridge Illustrated Atlas of Warfare: the Middle Ages. Cambridge University Press. p. 22. ISBN 978-0-521-44049-3. Archived from the original on 23 April 2017. ^ Peter Sawyer (2001). The Oxford Illustrated History of the Vikings. p. 57. ISBN 978-0-19-285434-6. ^ a b Peter Sawyer (2001). The Oxford Illustrated History of the Vikings. pp. 58–59. ISBN 978-0-19-285434-6. ^ a b Peter Sawyer (2001). The Oxford Illustrated History of the Vikings. p. 59. ISBN 978-0-19-285434-6. ^ Bertil Almgren (1974). The Viking. Wahlstrom and Widstrand. p. 75. ISBN 978-91-46-19959-5. ^ Anglo Forte (2005-05-05). Viking Empires. p. 80. ISBN 978-0-521-82992-2. ^ a b c Biddle, M; Kjølbye-Biddle, B (1992). "Repton and the Vikings". Antiquity. 66 (250): 36–51. doi:10.1017/S0003598X00081023. ^ University of Bristol (February 2, 2018). "Radiocarbon dating reveals mass grave did date to the Viking age". Eurekalert. Retrieved February 4, 2018. ^ Catrine L. Jarman; Martin Biddle; Tom Higham; Christopher Bronk Ramsey (February 2, 2018). "The Viking Great Army in England: new dates from the Repton charnel" (PDF). Antiquity. 92 (361): 183–199. doi:10.15184/aqy.2017.196. Retrieved February 2, 2018. Asser (1983). "Life of King Alfred". In Keynes, Simon; Lapidge, Michael. Alfred the Great: Asser's Life of King Alfred & Other Contemporary Sources. Penguin Classics. ISBN 978-0-14-044409-4. Forte, Angelo; Oram, Richard D; Pedersen, Frederik (2005). Viking Empires. Cambridge: Cambridge University Press. ISBN 978-0-5218-29922. Friis-Jensen, Karsten (2006). Mortensen, Lars Boje, ed. In the Presence of the Dead. Saint Canute the Duke in Saxo Grammaticus's Gesta Danorum. The Making of Christian Myths in the Periphery of Latin Christendom (c. 1000-1300). Copenhagen: Museum Tusculanum Press. ISBN 978-8-7635-0407-2. Gardiner, Juliet, ed. (2000). The Penguin Dictionary of British History (New Ed). London: Penguin Books. ISBN 978-0-1405-1473-5. Jones, Gwyn (1984). A History of the Vikings. Oxford: Oxford University Press. ISBN 978-0-19-215882-6. Halsall, Guy (2003). Warfare and Society in the Barbarian West 450–900. London: Routledge. ISBN 978-0-41523-940-0. Heath, Ian (1985). The Vikings. Oxford: Osprey Publishing. ISBN 978-0-8504-5565-6. Holman, Elizabeth (2009). The A to Z of the Vikings. Plymouth, England: Scarecrow Press. ISBN 978-0-8108-6813-7. Hooper, Nicholas; Bennett, Matthew (1996). "The Vikings in the Ninth Century". The Cambridge Illustrated Atlas of Warfare The Middle Ages, 768–1487. Cambridge: Cambridge University Press. ISBN 978-05214-4049-3. Kirby, D.P. (2000). The Earliest English Kings. London: Routledge. ISBN 978-0-415-24211-0. Nelson, Janet L., ed. (1991). The Annals of St-.Bertin (Ninth-Century Histories, Vol. 1 (Manchester Medieval Sources Series): Annals of St-.Bertin vol. 1. Manchester: Manchester University Press. ISBN 978-0-719-03426-8. Oliver, Neil (2012). Vikings. A History. London: Weidenfeld & Nicolson. ISBN 978-0-297-86787-6. Reuter, Timothy (2003). Alfred the Great: Papers from the Eleventh-Centenary Conferences (Studies in Early Medieval Britain). Aldershot, Hampshire: Ashgate Publishing. ISBN 978-0-7546-0957-5. Ridyard, Susan J. (1988). The Royal Saints of Anglo-Saxon England: a Study of West Saxon & East Anglian Cults. Cambridge: Cambridge University Press. ISBN 978-0-521-30772-7. Sawyer, Peter (2001). The Oxford Illustrated History of the Vikings (3rd ed.). Oxford: OUP. ISBN 978-0-19-285434-6. Sawyer, Peter (1989). Kings and Vikings: Scandinavia and Europe, A.D. 700–1100. London: Routledge. ISBN 978-0-415-04590-2. Smyth, Alfred P. (2002). The Medieval Life of King Alfred the Great: A Translation and Commentary on the Text Attributed to Asser. Basingstoke, Hampshire: Paulgrave Houndmills. ISBN 978-0-333-69917-1. Starkey, David (2004). The Monarchy of England Volume I. London: Chatto & Windus. ISBN 978-0-7011-7678-5. Welch, Martin (1992). Anglo-Saxon England. London: English Heritage. ISBN 978-0-7134-6566-2. Hadley, Dawn; et al. (2016). "The Winter Camp of the Viking Great Army, AD 872–3, Torksey, Lincolnshire" (PDF). Antiquaries Journal. 96: 23–67. doi:10.1017/S0003581516000718. Martin Biddle talks about Repton on Swedish Radio.